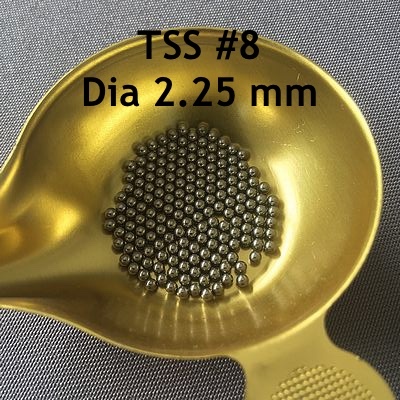 TSS # 8, diameter 2.25 mm is a ball that starts to be big. It is the lead equivalent of a ball of 3 at the penetration level which makes it a ball well suited to long shots because of its significant lethality. It can be used for shooting geese and ducks. TSS # 8 (2.25 mm) pellets can be used to pull large ducks up to a minimum of 60 m and geese up to 40 m. In fact, the 37 mm (necessary for the Mallard) penetration is reached up to 80 m and the 56 mm (required for the Greylag Goose) reaches 40 m. The pattern density of 40 m is of almost 7.4 balls per dm² for a charge of 40 grams classic and remains of 3.1 impacts per dm² to 80 m, shooting 2 ammo together with a "canardouze".